Organization: To start simply start with 2 balls, to speed up the intenisty you can use three should the ability of quality manage three balls at once. To start "A" passes to "B" who is situated between the poles, player "B" must make a movement away from the markers presenting an angle to play off the defenders shoulder and receive pass on a "Half Turn" using the inside of the back foot to play pass into the next player in line "1". "1,2 & 3" do the same as "3,4 & A". Progression: Rotate the direction so players are now having to receive on a "Half Turn" with their other foot. 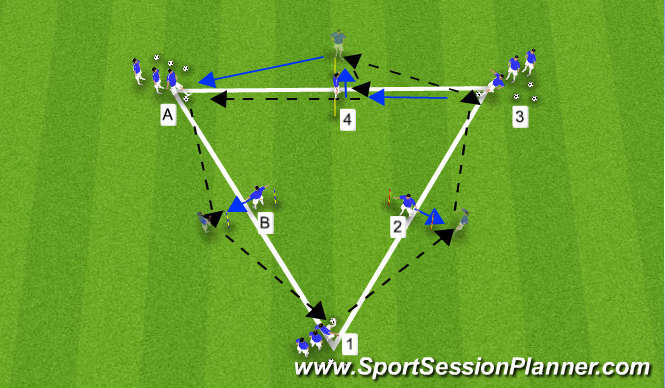 1st Progression: 1st progression is shown between player "3" who passes to "4" who plays a lay off into the run of "3" who plays long pass into "A". To make it fun as your players to score a goal between the two poles when playing their long pass into "A"
Coaching Points: Movement and angle of support, eye contact, quality of pass, pace/weight/accuracy, Communication, Turn, Man on?,Body positioning "Half Turn" , 1st touch into space, positive out of feet to set up pass.Timing and speed of movement to support first pass and second pass.